The Lunana trek can be combined with the Chomolhari trek to become the Snowman trek, a long and demanding trek taking three weeks. 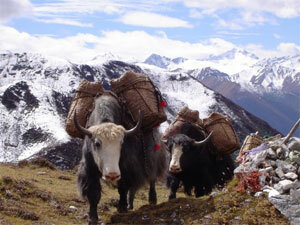 This trek is considered to be one of the most difficult in the Himalayas. It covers the distance of 356 kilometers (221 miles), crosses eight passes, several of which are over 5,000 meters (16,400 feet), and stays at an average altitude of 4,000 meters (13,000 feet). Connecting three of the most remote and high valleys along the northern border of Bhutan parts of which can cut off from the rest of the world for six months of year. This trek is best done in April-May and September-October. Day 02: Paro sightseeing and hike to Taksang. Hotel. Day 27: Drive to Punakha. Hotel. Day 28: Drive to Thimphu. Hotel. Day 29: Full day sightseeing of Thimphu. Hotel. Day 30: Depart Bhutan to Bangkok, Kathmandu or Delhi.